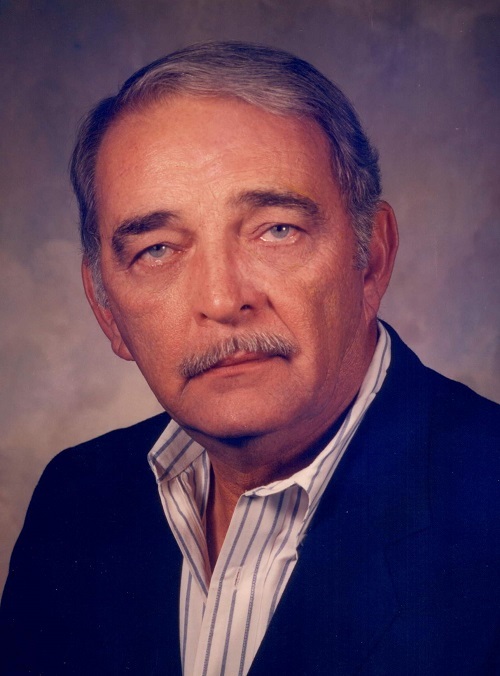 I never met James R. “Jim” Alfred. That didn’t mean I didn’t know who he was or what he meant to the City of Bridgeport. Alfred’s accomplishments and involvement in the city was fairly well known by anyone who has lived in Bridgeport or has spent a great time here. He was a Council member, a business man, a family man and an active member in his church. By all accounts, he did more than just do well on those fronts and others and for those that knew him in one of those roles or in multiple ones, it’s likely that’s what they’ll always remember him for. Certainly, that’s a good thing. Yet, when I think of Jim Alfred, who passed away April 22, 2013 at the age of 79, I think of something else. I think of the Giraffe that sits like a beacon in the night along U.S. Route 50 East, just in front of Alfred Construction. I saw it last week and thought maybe I should brush off this blog. I was certain I should do it when I received a message from my friend Andy McMunn of Clarksburg who wanted to know the story behind it to tell his own son. Curiousity with the giraffe is certainly a generational thing now. That Giraffe has served for more than 40 years as the official entity that lets travelers know they are entering Bridgeport or bidding farewell. You know what, if that was all Jim Alfred was known for that, too, would be a good thing. I can tell you that in my very young years – particularly on trips to Cool Springs Park in Preston County – the first thing my parents would let me, my brother and sister know about was that we needed to look up on the hill by the Alfred Mobile Home Park to see the Giraffe, which Alfred named “Stretch,” peering down on the cars below. While I’m sure there’s probably some statistical wiz that could figure out how many folks took a peek at the Giraffe during their travels over the years, I’ll venture it was easily tens of thousands if not hundreds of thousands. It brought joy to many a child and, for my family at least, a momentary break from an hour-long trip of chaos. During my last job in journalism, I noticed that “Stretch” had moved from his position near the mobile park to its current position along Route 50 by Alfred Construction. My colleague Lynn Vance and I discussed it and both felt it was worthy of story on the 16-foot fiber glass Giraffe’s history and the reason for the move. As it turned out, the story Jim Alfred told Lynn Vance back in 2007 – where he also told her the Giraffe’s official name – was fascinating. As it turned out, Jim Alfred never set out one day to purchase a fiber glass Giraffe. Instead, the trip that produced a Bridgeport icon named Stretch actually began decades ago when Alfred and his friend Bill Callison took a trip into Pennsylvania with Callison looking for motor homes to possibly rent. Alfred told Lynn Vance that Callison didn’t get the motor home, but he ended up spending $900 – delivery included – for the Giraffe. According to Alfred, there were several animals made of fiber glass situated in a field. There was a giant chicken, a big ape and, of course, the biggest of them all was the Giraffe. And after a little wheeling and dealing with the owners of the Giraffe, the purchase was made. The reason? It’s a classic. Alfred told Vance that there were plenty of wealthy people in Bridgeport, mainly those involved in the coal industry, and he would have something they – or anyone else for that matter – would not have. As history has told us, Jim Alfred was right. The first location of the Giraffe was actually set up near his home. The head of the Giraffe actually looked in the second story window of his home, he related to Vance. A few years later, the Giraffe moved down the hill beside the Mobile Home Park to a place where it would be for decades. It should be noted that the Giraffe wasn’t targeted like it was some sort of prized prey on the Serengeti. Once the Giraffe moved down the hillside and into view of the public, it became quite the popular roadside attraction. And that meant it was fair game for those with bad intentions. Alfred told Vance that in the 1970s, an attempt to steal the Giraffe was made. Fortunately, since the Giraffe was bolted into the ground, the attempt was foiled. Unfortunately, the thieves did manage to get away with Stretch’s head. It should be noted that the head on Stretch today is the original. 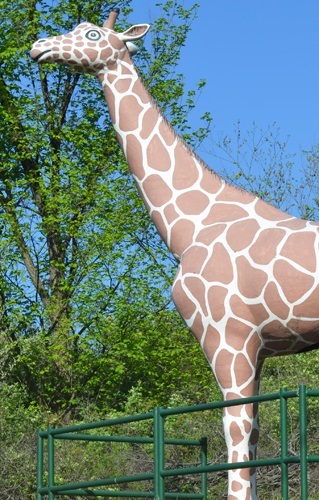 Fairmont Police actually found the head in a ditch along Country Club Road and when Alfred got it back, it was reattached, the Giraffe was repainted and Stretch lived happily in the same location until about 2007. Early that year, Jim Alfred decided to move the Giraffe in front of Alfred Construction. And for the first time since Stretch had his unfortunate incident where he literally lost his head, he got a fresh coat of paint for his new location. Lynn Vance told me that Jim Alfred was pleased with what had happened. He felt confident, she said, that it would be there for easily another 30 or 40 years. Let’s hope it’s around longer than that. If it isn’t, it’s safe to say Jim Alfred would have been the first to tell you he had more than a fair return on his $900 investment. And if you consider that thousands of smiles his move decades ago made, it’s safe to say Bridgeport and the entire area got more than their return on having Jim Alfred as part of the community. Bringing a smile to a child’s face is something that you can’t put a price tag on. Because of that, it’s more than fair to say Jim Alfred’s value to this community – even beyond Stretch – can’t be measured. It's been several years now since Jim Alfred has passed and one of his greatest gifts is still going strong. When it came to making kids smile, no one may have done it better. Editor's Note: Top photo shows Stretch as he stands today, while the late Jim Alfred is shown below. Hello! That's not the story Jim Alfred told me. He said he told his wife that if she could guess what he got her for Christmas that he would buy her anything she wanted. He knew she would never guess he got this! I've worked with Stretch for 11 years and he still makes me smile every day!